Pictured: Learners from various schools in the north engage with Exit during a recent performance. 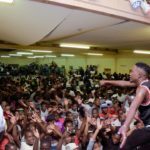 ENSURING that learners in the Northern regions of the country are motivated to excel in school, has become the mission of young Namibian musician, Exit, who along with Rockaz Entertainment embarked on the school talent scouting tour recently. According to Exit, whose actual name is David Shikalepo, the School talent scouting tour aims at developing arts at secondary level, motivating learners to study hard as school results keep decreasing yearly. “The decreasing of passing rates touches me very much, obviously the tour brings the son of the soil closer to the students,” he said. He explained that the tour is all about developing arts at secondary level, talking and motivating students on the importance of good education in order to achieve great results. “We want to reach out to every learner in Namibia if possible. Education goes hand in hand with arts, sport and cultural activities. 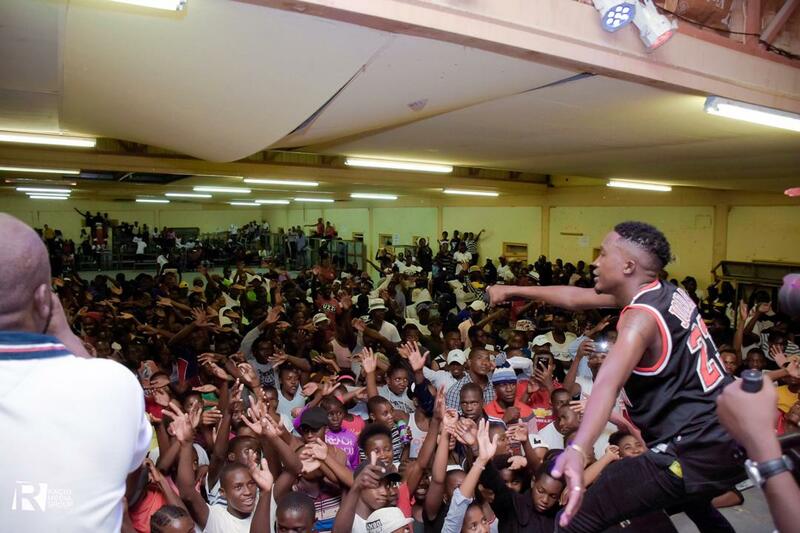 As an artist it’s my responsibility to go out there and talk to learners who are also my fans,” noted Exit. Tour organizer, January Ivula, said the tour was already talked about in January last year, but due to lack of finances it had to be delay. According to Ivula, a total of N$80 000 was invested in the tour in order to reach out to all schools. “We want to do so much but funding is a problem,” he stated. He noted that at the end of the tour, they want to see good educational results, with at least a 50 percent passing rate and above and for arts to be taken seriously at school level. Adding that education without art is empty. In 2017, Minister of Higher Education, Training and Innovation (MHETI) Itah Kandjii-Murangi called for a school talent scouting initiative to commence at an early age if the country was to industrialize and to have a diverse economy. She stated that the important of school talent scouting will act as a building block for higher education. The current tour started on 18 January and is expected to conclude at end of March, as more schools are said to be coming on board.